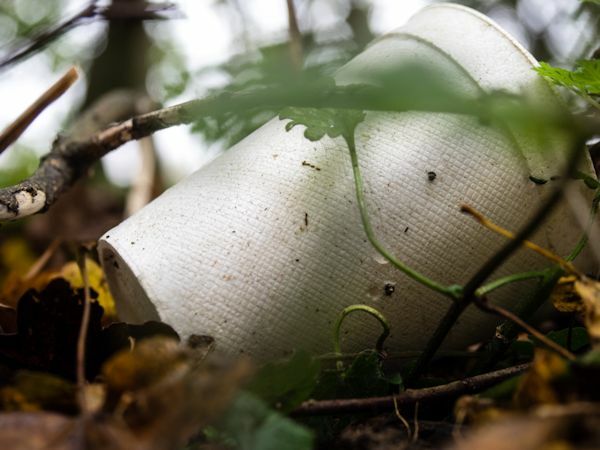 Maryland’s recent ban on styrofoam containers reflects long-standing concerns about polystyrene litter, which crowds landfills and pollutes waterways. Photo: Nik Stanbridge, Flickr Creative Commons. Click to enlarge. Maryland, where local jurisdictions have been passing no-styrofoam ordinances and some half of Maryland residents already live in areas where the foam containers were outlawed, recently became the first state in the United States to ban styrofoam carry-out food containers. It’s far from alone though. Foam bans are an issue, or a fait accompli, in New York City, San Diego, Washington, D.C., Los Angeles, Portland (both Maine and Oregon). That makes this a timely moment to see how things stand — foamwise — in your city, county or state. You may find a conflict near you if you look. The struggle over styrofoam, and plastics more generally, has been an epic political battle for years. Local activists and elected officials have succeeded in getting many local styrofoam bans enacted in big and small towns alike. But some businesses, such as many in the restaurant industry, like styrofoam containers because they perceive them as convenient and lower-cost. The result has been real contests in many town and county councils. In the United States, almost everybody believes that local governments know best and should be given leeway — until localities do something they don’t like. Not only have industry groups organized against local bans, but they have also organized at the state and national level. The conservative, industry-oriented, anti-regulatory group ALEC (American Legislative Exchange Council) has been offering model statewide “pre-emption” legislation, which outlaws local plastic bans, including styrofoam. This happened in Wisconsin, which passed pre-emption legislation barring bag bans. Polystyrene foam cups and food containers make up a lot of litter and pollution. They are not easily recyclable, and their volume fills up overcrowded landfills — when they make it that far. Once in landfills, styrofoam may not break down for more than 500 years. As litter, it often breaks up into little pellet-like cells and floats away as water pollution, ultimately to the oceans, where it can harm marine life. While foam containers are not especially toxic in most situations, they can leach styrene, which can be toxic with sufficient exposure. Practical alternatives to foam containers are available. An accompanying SEJournal Online backgrounder has a fuller discussion. Does your locality have a styrofoam container ban in effect? How is it working? Do people and businesses like or tolerate it? Are substitutes available? Has your city or county council been considering a styrofoam or plastic ban? Have any previous attempts passed or failed? How do the votes line up? What local interest groups are engaged? Check in with local park, stream or beach cleanup groups and projects. Do they characterize the waste they collect? How does styrofoam rank? Are any restaurants and similar stores in your area already using styrofoam alternatives? What are they? Are business owners and customers happy with them? There are a lot of groups lobbying and politicking on both sides of the foam container issue. There may be some near you with a local or regional focus. This list is hardly exhaustive. Restaurant Action Alliance: This food industry group, focused on New York, opposes efforts to ban foam containers. EPS Industry Alliance: Represents a broad range of industries that make or use polystyrene foam. Plastic Pollution Coalition: Works nationally to support local efforts to ban single-use plastic, including polystyrene foam. Surfrider Foundation: A nationwide organization organized in local chapters working for cleaner coastal waters. Beyond Plastic (U.S. PIRG): A nationwide network of grassroots groups opposing throw-away plastics including styrofoam. National Council of State Legislatures: This nonpartisan organization represents state legislature and does solid research on issues, including plastic bag legislation. PlasticBagLaws.org: A nonpartisan research organization that offers information mostly about state and local bag laws rather than foam containers. * From the weekly news magazine SEJournal Online, Vol. 4, No. 15. Content from each new issue of SEJournal Online is available to the public via the SEJournal Online main page. Subscribe to the e-newsletter here. And see past issues of the SEJournal archived here.